The tree looked perfect from afar. It’s beauty didn’t waver in my eyes. for the tree still thrived. by birds or blue skies. I’ll want you now and tomorrow. I’ll trace your scars with my fingers. Of which there are many lol -_- 😀 Great job Rose, learnt a new word too. Patron saint of wayward writers, imperfect poets and jacked-up trees. 🙂 I like your wabi-sabi pine, Rose. Lovely poem. Such a lovely tree and such beautiful sentiments, you. Thank you very much! Killer sideburns, sir. Haha! I’m a such a dip for even forgetting the dip. Yes, a huge bowl just for you, my chippy pal! Every broken tree deserves a poem. You should take more photographs and write about what you see — I think everyone would enjoy your creative view. 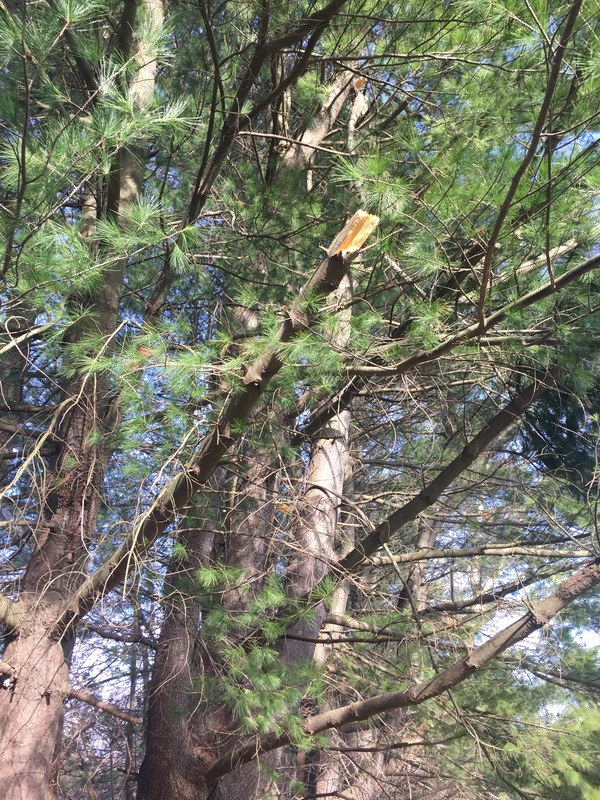 I have a pine with broken branches like that. Wish I had thought of the analogy that appears at the end of the beautiful poem. As U noted, “the tree still thrived”. The upward-pointing remainder of the branch stands as a middle-finger salute to the snow storm that broke it. The imperfections is often where true beauty lies. Good poem. I concur! Thanks so much for your visits, my talented friend. Tops, my dear Poet tops full of symbolism. Many thanks Paula! I’m glad you picked up on the symbols. Simple pleasures and nature are a winning combination. Thank you very much! I love the analogy from a tree to a person… lovely. I wonder too if the tree feels that anything is wrong. Do the birds let it know? Hmm… birds can be pretty brash, and they do like to Twitter, so it wouldn’t surprise me if they let the tree know one way or another. 😀 😀 Thank you JC!! Ah, thank you much Derrick! of your words & fingers! Yes, those rattling skeletons provide endless fodder for the creation process. Might as well make use of them…they aren’t going anywhere. So, so beautiful, Rose. We all want that one special person who thinks we are perfect as we are, and yearns to trace our scars with their fingers. A beautiful poem about life and relationships. When we get close to each other we all show some blemishes or scars. But that’s what make us who we are, no? Great feelings and nice piece of art!! Nature never judges, it is the best refuge for the broken and marred. Such a wonderful poem! Perfect in its imperfections, and thriving …that’s how we all are. Isn’t it. You conveyed it beautifully through the tree, Rose. The real beauty lies in imperfection. For me, otherwise, it all look so made-up….plastic. As always, I really liked your words.